This is the perfect time of year for strawberries. While it is true that you can get strawberries pretty much year round, this particular time of year is when they are at their best. One thing I always do when choosing a carton of strawberries (after looking the carton over to see that they all look nice) is smell them. I know, I know...even my friends give me strange looks sometimes because of it. But the smell of delicious, ripe, perfect berries is quite intoxicating to me. If you can't smell the sweetness, then odds are those berries won't taste all that great. I know you've gotten strawberries before that look all pretty, shiny and crimson before only to take them home, cut them up and realize they're all white and unripe inside. Smelling the carton is a great way to distinguish ripe from not-quite-there-yet. Random Strawberry Facts: A strawberry isn't actually considered a "berry" since the seeds are on the outside, each of which are considered it's own fruit. An average strawberry has around 200 seeds on the outside. One cup of unsweetened strawberries averages around 55 calories. 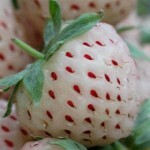 It would be very interesting to try either a White Alpine Strawberry or a Pineberry. A Pineberry looks like an inside out strawberry with it's white or pale pink flesh and red seeds and is actually supposed to taste similar to a pineapple/strawberry mix. Click on any of the links to buy Pineberry plants! 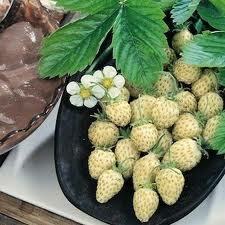 A White Alpine Strawberry is white or golden in color and has yellow seeds. I've never actually seen either berry, but they do look very interesting. Maybe one day I can try one! Click on any of the links to buy White Alpine Strawberries! Stir together the flour, salt and sugar to begin making your pastry. Add the butter cut in the butter until the mixture resembles coarse meal. In a small bowl, using a fork, beat the egg with the vanilla and 2 Tbs. of the cold water. Make a well in the flour mixture and pour in the egg and about 2 more Tbs. cold water. Mix lightly with the flour, adding more ice water as needed until the mixture holds together. Pat into a ball and wrap in plastic wrap. Refrigerate for 1 hour. Meanwhile, make the lemon curd: In a heavy (non-aluminum) saucepan over high heat, combine the lemon zest, lemon juice, sugar and butter. Stir until the sugar dissolves and the mixture comes to a boil, then remove from the heat. In a bowl, using an electric mixer set on high speed, beat together the eggs and salt until fluffy. Slowly beat in the hot lemon mixture. Return the mixture to the saucepan over low heat and cook, stirring constantly, until thick enough to coat the back of a spoon, about 4 minutes. Do not boil. Remove from the heat and transfer to a bowl. Cover with plastic wrap, pressing it directly onto the surface of the curd. Refrigerate until cool. On a floured work surface, roll out the pastry into a round about 13 inches in diameter. Transfer to an 11-inch tart pan with a removable bottom, trim the edges to make them flush with the pan rim, and prick the bottom in several places with a fork. Press a piece of aluminum foil, shiny side down, onto the crust and freeze for about 30 minutes. Bake the foil-lined pastry shell for 8 minutes. Remove the foil and continue to bake until lightly browned, about 6 minutes more. Transfer to a rack and let cool completely. In a small saucepan over medium-high heat, melt the jelly with the water. 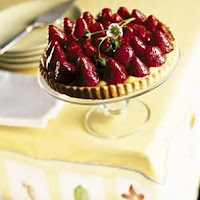 Remove the sides from the tart pan, then slide the pastry shell off the base onto a serving plate. Spoon about 2 cups of the lemon curd into the shell (reserve any remaining curd for another use). Arrange the strawberries on top, stem end down. Brush the strawberries with the melted jelly. Refrigerate until set, about 30 minutes, before serving.